Have you wondered what those two bright “stars” are in the skies lately? 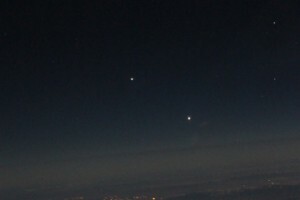 They are the planets Jupiter and Venus, dancing the night away through the heavens. The biggest and brightest is Venus, as it is closer to our planet. How does this dance effect us? With these two planets in Taurus, we focus our energies to move ahead with our worldly goals, and with determination we meet them.